Don't give even one more boring presentation. 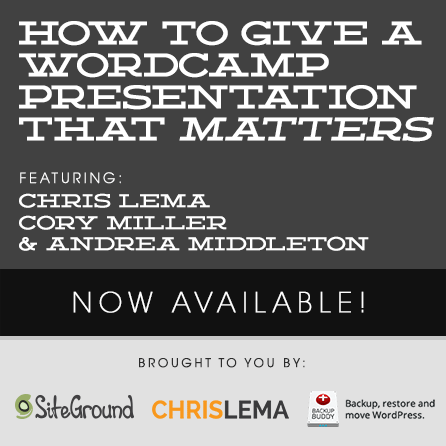 Learn from Chris Lema, Cory Miller, and Andrea Middleton's decades of shared experience about the simple things you must know before giving any presentation. With practice, anyone can deliver a meaningful and memorable presentation. Do you want to simply talk, or do you want to change lives? Are you interested in presenting at a WordCamp (or another event entirely)? Have you given a presentation before and were underwhelmed by the response? Or maybe you’ve been in the audience of a poor presentation and are afraid to repeat the presenter’s mistakes? No matter what state your presentation skills are in, no matter what topic you want to present, this event aims to make you a better presenter. Not just a slightly better presenter, but an order of magnitude better. If you’re looking to deliver a valuable, memorable presentation that has the power to change minds and lives, you owe it to yourself and future attendees to hear this session. And if you’re not looking to provide life-changing value, why are you wasting time presenting? Anyone who takes the time to watch this session and absorb the unique perspectives and decades of insight that Chris and Cory provide will be a measurably better presenter when they’re done. This live session will take place July 19th, 2014, starting at 1pm EST. How do you come up with a topic? Do you write everything down word for word? How long does prep take you? – These are questions Chris gets every time he presents. Come hear his answers and approach for creating a talk people will remember weeks or months from now. Cory takes a slightly different approach to his preparations, and his style is vastly different from Chris’s. This difference is neither more nor less effective, and that’s why it’s important to hear. Seeing how these different approaches yield a similar outcome will help you to broaden your perspective in terms of presentation style and see that there is often more than one right answer. You have lots of questions, and Chris, Cory, and Andrea are prepared to answer all of them. How do you change someone’s life with a WordCamp presentation? Andrea will talk about ways to identify the unique, inspirational story you have to share. She’ll dive into detail about how your voice has the power to impact hundreds and thousands to bring about real, measurable change in their lives.